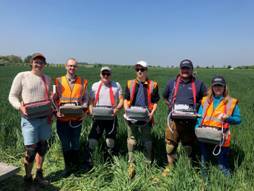 Research collaboration between University of Essex, NIAB and Bayer Crop Science. Rationale: It has been estimated that increases of 50% will be required in the yield of grain crops such as wheat and rice if food supply is to meet the demands of the increases in world population. There is clearly an urgent need to develop crop plants that yield higher outputs per unit area of land, without having to increase inputs of fertiliser or water. The overall aim of this research proposal is to use novel screening techniques to screen a wheat MAGIC population for (1) enhanced photosynthesis in wheat flag leaves and ears and (2) improved speed of stomatal responses to dynamic changes in the environment. 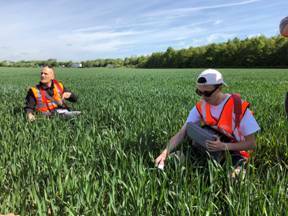 Using thermal imaging we will assess variation in stomatal responsiveness to changes in light, temperature and water status in order to determine wheat lines that can optimise stomatal behaviour for leaf/canopy temperature optimal photosynthesis. Using chlorophyll fluorescence we will determine photosynthetic rates and capacity in the flag and ears in a wheat MAGIC population. A detailed physiological screening protocol will produce key traits that will be used for QTL analysis. Flag and ear photosynthesis and canopy temperature will also be evaluated in field trials on selected lines. Results from both the laboratory and field studies will be used to identify and select HIFs for further analysis. A major outcome of this work will be production of HIFs for gene identification and future breeding programmes. Summary: World demand for food is growing and it has been estimated that a 50% increase in yield will be needed to meet the increasing demand due to the growing world population. This situation is further exacerbated by the changing climate and the competing demand for plants as biofuels. Photosynthesis is the process by which plants use the energy from the sun to convert carbon dioxide (CO2) from the atmosphere into carbohydrates and other chemical compounds, which are used for growth. Photosynthesis takes place in all green parts of the plants and although most research focuses on leaf photosynthesis, recent studies have shown that ear photosynthesis is important for graining yield, particularly when leaves maybe damaged or stressed. Furthermore, in order for leaf photosynthesis to take place CO2 must enter the leaf through adjustable stomatal pores and at the same time water is lost through these pores cooling the leaf down. It is important to maintain an optimal leaf temperature for photosynthesis, as high temperatures greatly reduce photosynthesis and crop yield. Stomata are continually adjusting to changing environmental conditions to balance CO2 uptake with water loss. The greater the speed at which stomata react to such changes in the dynamic environment the better they can coordinate CO2 and leaf temperature which leads to optimal photosynthesis and grain yield. The aim of this research proposal is to identify wheat lines and the genes behind enhanced stomatal dynamics for optimal leaf temperature and enhanced ear photosynthesis for breeders to use to increase wheat yields. 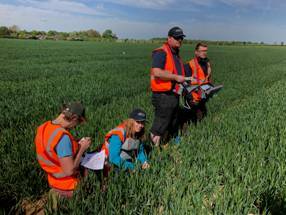 Using a MAGIC wheat breeding population will allow us to identify specific DNA regions and deliver selected wheat parental lines for future breeding programmes. In the past new crop varieties have been produced by crossing together existing strains with traits of interest. This undirected approach did not always lead to the selections of strains displaying higher crop yields. Nowadays, genetic fingerprinting of varieties allows us to precisely identify good progeny. MAGIC wheat breeding populations work on this principle and rely on crossing several founder lines (or parents) to produce a diverse population with a genetic map. We will use a MAGIC population of wheat to find gene regions which lead to high ear photosynthesis and rapid stomatal movements which are beneficial traits for future breeding programmes aimed at increasing food productivity. ​Impact: The project contributes to the Food Security Strategic Priority of the BBSRC. A key impact delivered through conventional breeding programmes will be improvements in wheat varieties better adapted to different environments. Varieties with greater levels of productivity and water use efficiency will help meet essential targets in food security and sustainable food production in the UK and worldwide. 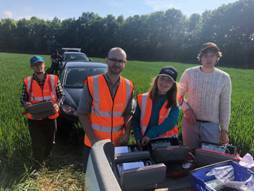 The research addresses environmental sustainability of crop production through use of novel high-throughput photosynthetic phenotyping combined with genetic mapping to identify markers that can be applied in practical wheat breeding programmes. Better understanding of the control of stomatal dynamics, canopy temperatures and the role of ear photosynthesis in plant carbon gain will accelerate the development and manipulation of plants for more efficient photosynthesis, the process that ultimately drives productivity per unit cultivated land area. Breeding programmes that incorporate project findings will be better placed to develop varieties with improved stomatal dynamics, and thus increased water use efficiency and greater carbon gain per unit of resource (water, land, nutrients) input. This contributes to the sustainability of food production. One of the main challenges for crop improvement programmes is identifying genetic targets that have significant and predictable impact on yield. This research will lead to a greater understanding of stomatal dynamics and limitations to photosynthesis (via control of CO2 diffusion and leaf/canopy temperatures) and consequently productivity. 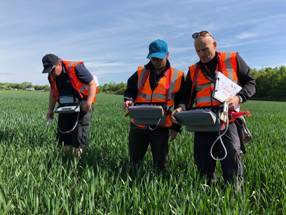 It will quantify the role and contribution of ear photosynthesis to yield, which will help prioritise this trait as a potential breeding target. The identification of loci or even genes that control ear/leaf photosynthesis and stomatal dynamics should lead to the development of markers to assist selections. By using the established MAGIC population we will contribute substantially to the growing body of phenotypic and genotypic data describing these lines, enabling future work that can include modelling genotype x phenotype interactions and system biology network models. 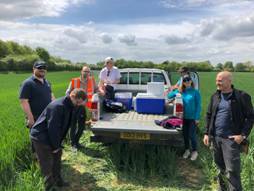 Findings that contribute to our fundamental understanding of leaf gas exchange and photosynthetic regulation can be applied to other species, and ultimately, translation of this research to other crops will benefit the UK and global economy and food security.